Hi everyone! Today the My Time Made Easy team is a sneaking a new template from the April release at My Time Made Easy. We have two new templates being released this month, and this one is called Berry Sweet Basket. Let me begin by saying that this basket is HUGE!! I was shocked at its size! Lots of room for a variety of things! The first thing I did was print out Well Woven digital paper in the Green Pasture color (yes, this basket is actually green, but it looks brown!). I actually printed it on both sides of the paper so it would be finished off on the inside too. See what's inside? That's new too! We have a new cut file called the Apple a Day cut file. I printed three of them: two in the actual size and one sized down to 75%. The top "leaves" is from the Fanciful Flowers cut file. I ran it through the Swiss Dots embossing folder and attached it with a brad. I know a lot of people who make jellies and jams, and after I made the basket I thought it would be a nice way to present those jellies and jams to someone. 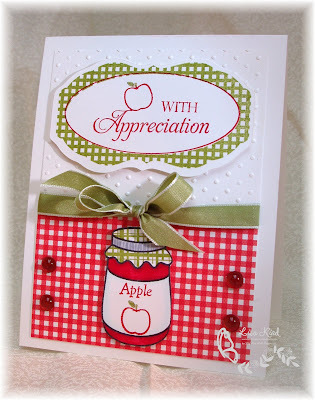 So I created a card with the Well Preserved stamp set and made an apple jelly jar to go on it. The label is another new cut file being released this month called Occasional Label. 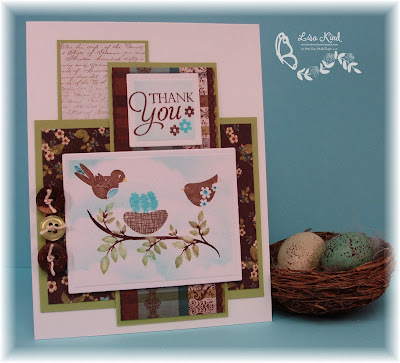 I stamped it with the new Occasional Labels stamp set (the checked outline) and Sentimental Occasions stamp set. I added the apple from Well Preserved as well. 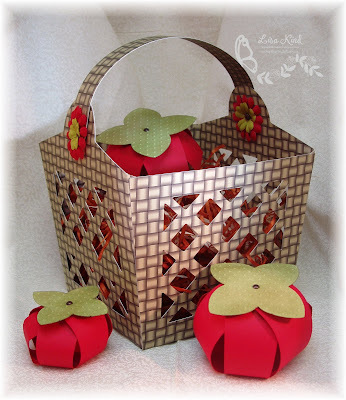 I liked the red checked paper (from Doodlebugs)...it matches the red apple theme. The MTME girls have more inspiration for you to check out. You can find the links on my side bar, or just head over to Lauren's blog for links. We also have Amy Sheffer as our Guest Designer this month! Please stop by to see her fabulous work! 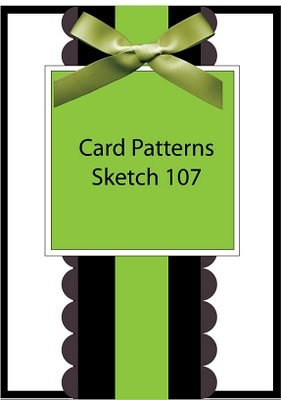 Also stop by the MTME blog for the new Pretty Patterns sketch challenge. Tangii has her new team together and you'll see some great creations there too. They'd love to see you playing along! Tomorrow is release day at MTME! More cool stuff for you eyes! See you then! Thanks for stopping in today! Hi everyone! 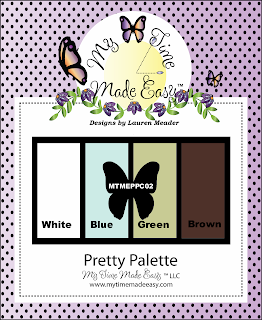 Are you ready for another Pretty Palette color challenge from My Time Made Easy? I hope you like this one! I love blue and brown and I thought the addition of green really made it more organic. Here's what I created with them. I found the perfect paper to go along with the colors (ok, I picked the colors from the paper because I chose the colors for the challenge!). It's from Prima, but I cannot remember the name of it as I write this. I backed it with some certainly celery cardstock. I chose to use the Singing Silhouette stamp set for the main panel. 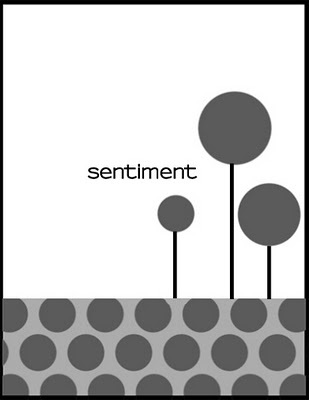 The sentiment is a sneak peek of what's to come from MTME later this week! I added the stamped flowers from Singing Silhouette. 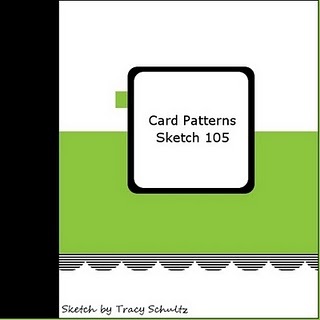 The sketch is from this week's Pretty Patterns sketch challenge. I changed out the ribbon for the buttons. 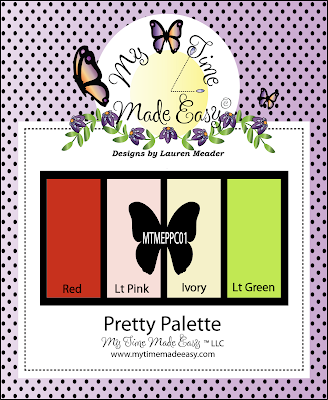 If you'd like to play along, head on over to the Pretty Palette challenge on the MTME blog. I can't wait to see what you create! Hello my friends! This week is technique week at Just Us Girls and Dana has chosen another great flower technique. You may have seen these zipper flowers around blogland recently. They really are cool! Here's my attempt at this flower. My flower does not have the ruffle effect that some of the flowers the JUGs girls created. I think my zipper should have been shorter. Anyway, I still like it! 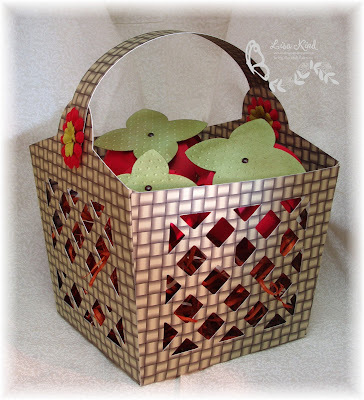 Dana did a tutorial on how to create these little beauties on the Want2Scrap blog. Very easy to do! I purchased zippers in various colors, but ended up using this black one with the silver teeth. I paired it with patterned paper from Fancy Pants called It's the Little Things and PTI's aqua mist cardstock and ribbon. The sentiment is from Paper Makeup Stamps. I knew I had this stamp, but had to search for it for a while to find it. I thought it would be perfect for this card. The bow was made using the Bow Easy tool. The pearls where white, but I colored them with a BG18 copic marker to match the aqua. 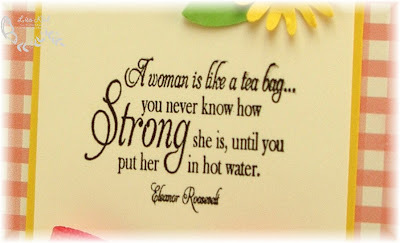 Love that we can do that! The leaves were cut with a die from PTI. The layout is from this week's Mojo Monday. I hope you try this technique this week. The zippers are fairly inexpensive to purchase or you may have some old clothing you don't need laying around that have a zipper you can salvage. If you do try it, make sure you link your project to the JUGs blog. You can also stop by there to get some inspiration from the JUGs girls. Thanks for stopping by this Saturday! I'd love to know what you think of this technique and my flower! 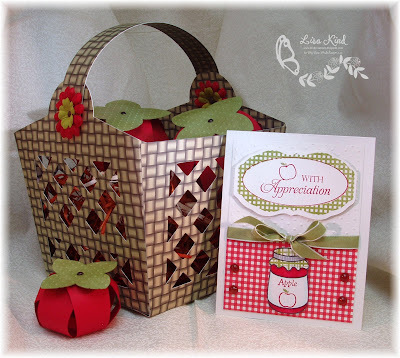 This week our sponsor at Christmas Stampin' All Year Long is Perfect Presentation. 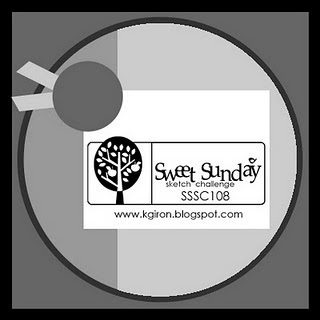 They have a bunch of really cute templates, labels, tags, and such in PDF, SVG, and GSD files. The challenge on CSYAL this week is called Make It Your Own. We are challenging you to create your own pattern paper and use it on a Christmas themed package or project. I chose a cute and simple little template called Easy Candy Wrap. I love the way this came together and it would be so easy to create a bunch as gifts or favors. They could also be created in any size you like. I chose to cut it out of Neenah white cardstock and then stamped it in real red using this peppermint candy image from a set by My Time Made Easy called Sugar and Spice. 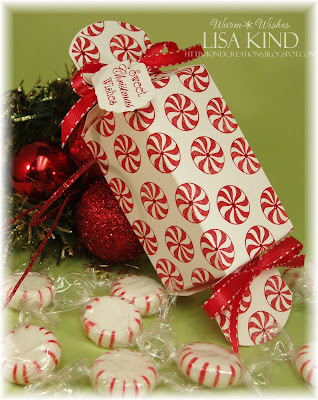 There is a dot of red stickles in the center of each candy to make the box sparkle a bit. I tied it off with some red ribbon and added the tag cut with a nestie. The sentiment is also from Sugar and Spice. 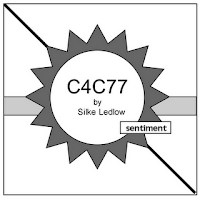 If you'd like to see what the CSAYL girls have created using templates from Perfect Presentation, stop by the CSAYL blog! You won't be disappointed and will find some great inspiration for all those gifts you'd like to create for the holidays. We hope you play along...you could win a template of your choice from Perfect Presentation! Hi everyone! I'm here today with news of another new challenge from My Time Made Easy. Every Sunday, I'll be hostessing this challenge and I'll try to have some really fun colors to work with! I hope to see all of you playing along with me! Here are this week's colors. I picked these colors from a dp in the October Afternoon Thrift Shop collection. Here's how I used them. My mom's birthday is today and this is her birthday card. I started with an ivory base and added the certainly celery cardstock and dp. On the middle section, I ran a piece of certainly celery through a cuttlebug folder and distressed it a bit with tea dye distress ink. (I also distressed the other layers with this ink.) The scallops were punched with a Martha Stewart punch with red riding hood cardstock. The ribbon is seam binding from Debbie Marcinkiewicz's etsy store. For the center piece, I used the Framed Elegance cut file and stamped it with riding hood red ink with the frame stamp from Framed Elegance stamp set. The butterfly is from Bold Botanicals and was stamped on the frame with memento rich cocoa ink and once again on a scrap piece of ivory carstock. I colored both with copic markers and then cut one out. The body of the butterfly is adhered to the frame and star dust stickles were added to the wings. I hope you'll stop by the new MTME blog and play along. There are some prizes to be won if you play all month long and we are looking for a DT for this challenge! Thanks for stopping by! Happy Saturday everyone! I'm the hostess this week over at Just Us Girls and we have Paper Makeup Stamps as our sponsor. 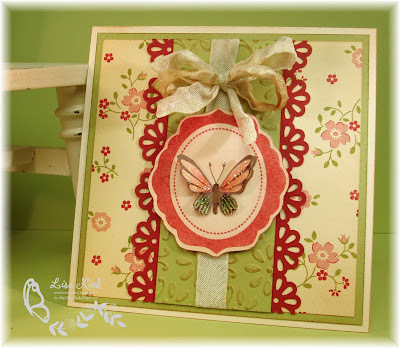 Basic Grey's Hopscotch paper was my inspiration for this pretty color combination. Here's what I created with them. Since I have been a design team member of PMS since almost it's inception, I have quite the collection of stamps from them! I wanted to use something that hasn't gotten a lot of love. So I settled on this bird house image from the Home Matters set. (This set comes in rubber and digi form, with a couple of more images in the digi set.) I used the Clean & Simple FTL132 layout for my card. On the tallest bird house, I had to extend the pole with a black marker. I colored the images with copic markers and added some star dust stickles. I added the ribbon, Prima burlap flower, and flower-shaped button tied with some floss. The background looked a little bare, so I added the soft clouds with some soft sky ink. The sentiment is from the Tweet Things set, also from PMS. It actually says "Happy Bird-Day to you", but it didn't all fit, so I only inked up the part I wanted (love that option!). Paper Makeup Stamps is offering a $20 gift certificate to one random winner over on the JUGs blog. 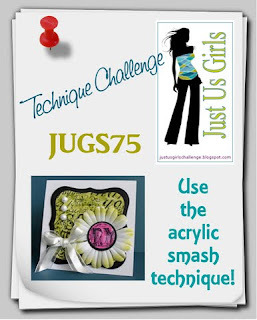 You can see what the design team has done with the PMS images on the JUGs blog...fabulous designs! I hope to see your creation there! 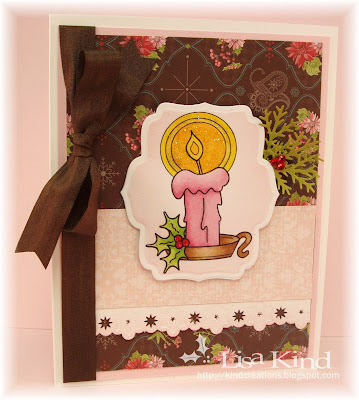 Christmas Stampin' All Year Long #3 - "I Can See Through That"
Hello my holiday friends! 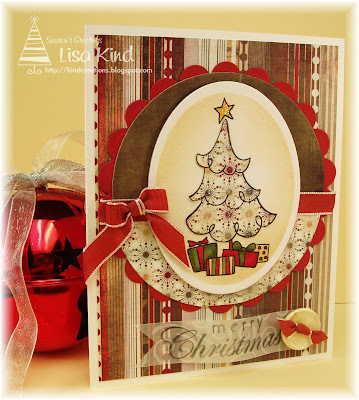 I'm here today with another Christmas Stampin' All Year Long challenge. This week our sponsor is In Style Stamps. The challenge this week is to use vellum on your projects. Here's my card. My image is a digi image appropriately called Christmas Tree. I printed the image on PTI white and then again on a small piece of dp from Basic Grey's Wassail paper pack so I could paper piece the tree. (I printed the image on computer paper, cut a piece of dp to fit over the tree, and adhered it to the computer paper over the tree image with removable tape. Then I ran that through my computer.) The presents are colored with copic markers and I added star dust stickles on the tree and star. I used this week's sketch from Sweet Sunday Sketches and flipped it on its side. The ribbon and red cardstock are Riding Hood Red. The sentiment is from Season's Greetings Sentiment Set by Paper Makeup Stamps. It's stamped on some old vellum from SU that has white swirls on it. I made sort of a banner out of it. The button hides the glue dot that's holding that end. I used a glue pen to adhere the other end. Stop by the Christmas Stampin' All Year Long blog to see what the design team has done with these fabby stamps and the vellum challenge! We hope you can play along with us as well! One random winner will win four digi images of their choice from In Style Stamps! Happy Thursday my friends! And Happy St. Patrick's Day too! 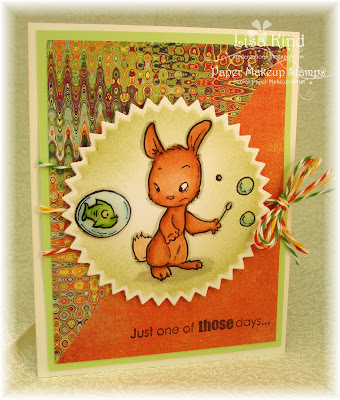 I don't have a St. Patty's card to share with you (and I really have a cute St. Patty's image too! ), but I do have some exciting news! My Time Made Easy is entering the challenge world with two challenges and a new blog. Every Thursday, MTME will have a sketch challenge named Pretty Patterns and on Sundays a color challenge named Pretty Palette. Here is today's first Pretty Pattern. I found working with this sketch was so easy! Here's what I did. MTME is also releasing digital images on the 15th of each month. This little guy, called Bizzy Bunny, was just released the other day. You can find the new images here. I printed the image and colored it with copic markers. There's liquid applique on his little tail and star dust stickles on some of the carrots. I used paper from the True Blue pack from My Mind's Eye. 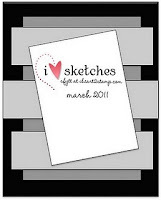 I hope you can stop by the My Time Made Easy blog and play in our sketch challenge. You can also see some more samples from the team using this sketch. Have a great St. Patty's Day...drink some green beer and eat some corned beef! LOL!!! I'll be having reuben sandwiches at my in-laws' house and later I'll be at our local Irish Center to hear some live Irish bands and watch the Irish dancers. A fun evening for sure! Thanks for stopping by! Hi everyone! Whew! I'm about 13 hours late in posting this card for this week's Just Us Girls Technique challenge! Maria chose a really great challenge and I thought I had what I needed to complete the challenge. However, last night when I started gathering the materials I needed, I realized I didn't! (See what I get for being so last minute?) The techniqe is called Acrylic Smash and you can find it in the resouces section of Splitcoast Stampers. All you need is some acetate (some of us used cut up PTI boxes or the acetate that acrylic stamps are mounted on in their packaging...very clever), acrylic paint or the Ranger Paint Dabbers, and a sponge applicator if you don't use the Ranger paint. I went out this morning and bought some transparencies from Office Max and some acrylic paints from AC Moore. Here's my card. While I was at AC Moore, I looked at the paper packs (big mistake!). I saw this lovely pack from K&Co. called Que Sera Sera. I fell in love with the colors and patterns, and used a piece on this card. For the technique, I stamped this new sentiment from Paper Makeup Stamps and the flowers from Friendly Flowers (also PMS) in black Stazon ink on a piece of transparency. After it dried, I turned it over and applied Orange Poppy acrylic paint (from Folk Art) using the sponge applicator. I used a swirling motion to get this interesting look. I then applied the transparency to a white piece of paper of the same size and sort of "smashed" it together. You don't need any adhesive because the paint acts as the adhesive. Then I just added my decorative glittered flowers, a decorative border, and was done! It's really a very easy technique and I love the look! The JUGs DT have also created some great cards using this technique. 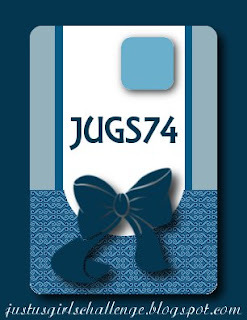 Please stop by the JUGs blog to have a look. We have Alyssa Scritchfield as our Guest Designer this month as well! If you try this technique, you can link it up on the JUGs blog. We'd love to see what you've done! Are you ready for another Christmas card? Can I entice you into starting yours? This week, Christmas Stampin' All Year Long is being sponsored by Deedee's Digis. A random winner this week will win a $10 credit to the digi store. Can't beat that, huh? MacKenzie chose to challenge us with an inspiration challenge. 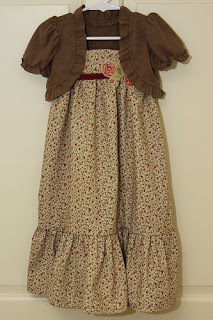 It's a really cute little brown dress. Here's the inspiration picture. And here's how I interpreted the inspiration. The digi I used is called A Light into the World. I printed it on PTI paper and colored it with copics. The flame and glow around it were sparkled up with star dust stickles. 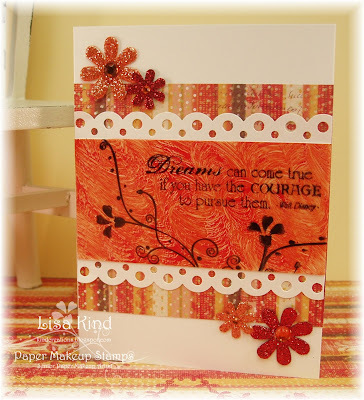 The inspiration piece led me to this brown flowered dp called Holiday Treasures from SU. The pink dp is also SU, but I don't have that name available right now. I added a white piece punched with a Martha Stewart snowflake border. I sponged some pink on it to tone it down a bit. The brown ribbon was added to the side and tied in a bow. I added the ferns and red bling to mimic the holly leaves on the image. I used the Card Patterns sketch from this week. Well that's it for me. Another card added to my Christmas collection! I hope you join me in my quest to get my cards done by Christmas without any stress! And you can possibly win something too by playing along! 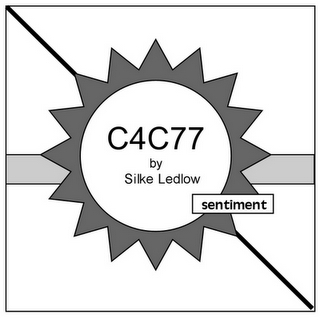 Stop by the CSAYL blog and see the samples from the design team for more inspiration. Hi everyone! 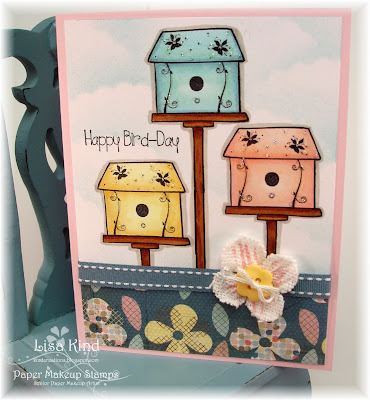 Did you see the new release from Paper Makeup Stamps? It was another great one! 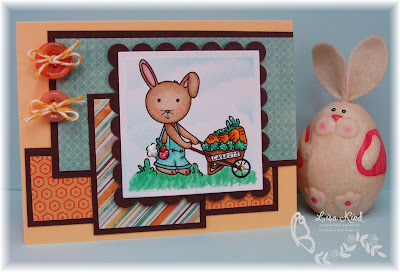 I've used the new Springtime Solids set on this card today. I tried something a little different on this one...I used a page from a dictionary that I got at the dollar store! I distressed it with Wild Honey distress ink and stamped the stem in certainly celery and the flowers in apricot appeal. On the apricot carstock, I stamped the small flower in apricot appeal to create a pattern. The shabby seam binding is from Debbie Marcinkiewicz's etsy store. On the bow, I added this pretty prima flower. The sentiment, from the Birthday Cheer set from PMS, was stamped in certainly celery. Super simple card that took about 30-45 minutes to create! Love when that happens! 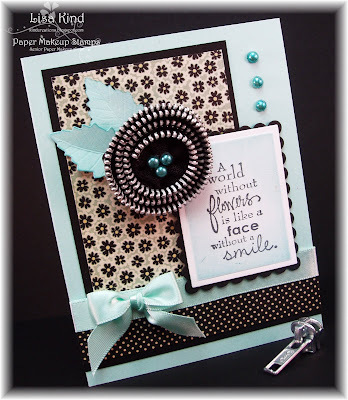 Some of the PMS DT have created cards with some of the new stamps and you can check them out on the PMS blog. Thanks for stopping in today! Enjoy your day! Paper Makeup Stamps Release Day Blog Hop! 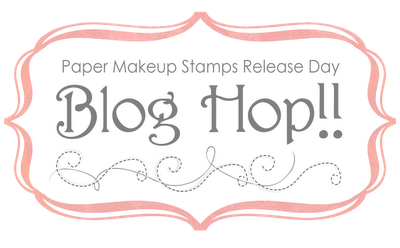 Welcome to the Paper Makeup Stamps Release Day Blog Hop! Today is the day you will be able to purchase all the wonderful stamps you've been seeing! If you've just stopped by my blog, please make sure you start at the beginning, the PMS blog, to get all the information about our hop. If you're on the hop, you should have come from Dawn's blog and saw her Sally Sheep creation. Today, I've got the Danny fairy to show you. When I thought of the name "Danny", I thought of a little Irish boy. So I went with this green paper from the Oliver paper pack by Basic Grey. And, of course, I gave him reddish hair! I used the March sketch from Sketch for You to Try. I found it very interesting and it worked perfectly with my image. I added very little embellishments to let the papers and image take center stage. There is also another larger dragonfly available for purchase as well called Danny's Dragonfly. This dragonfly and Danny's wings have star dust stickles on them. The sentiment is from the Little Moments set. I find that really is a great go-to set lately. You should have been collecting letters along the way to spell out a quote which will get you 15% off the new release. 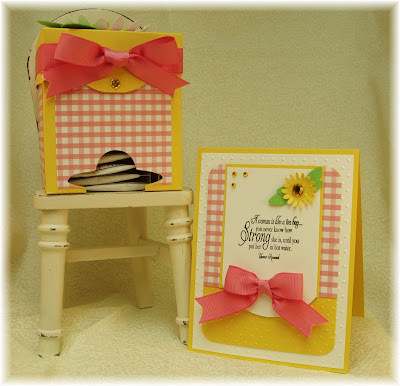 My letter for you today is N.
Now I'm going to send you to Christi Snow's blog to see her fabby creation. Thanks for stopping by! Hope to see you tonight at the Release Party! Hello friends! Paper Makeup Stamps is in Day 3 of the sneak peeks. Today we are revealing the new Monsters and Retro Critters. I'm here with this funky little bunny named Foo. Cute image, huh? I just love that bubble with the fish in it! Poor Foo looks perplexed by it! That bubble was stamped twice, cut out, and popped up. It also has Crystal Effects on it (as do the other bubbles). I used paper from Basic Grey's Lime Rickey paper pad, and used the Crazy for Challenge sketch as my starting point. (I made a mistake and cut the papers on the wrong angle.) I chose three colors of baker's twine to tie in the middle. The sentiment comes with these bunny image. It sums up my week for sure! LOL!!! You can see more sneaks on the PMS blog. The fairies and other new images have also been revealed over the last few days. Tomorrow is release day and we are having our usual blog hop all day starting at 7:00 am EST. Then at 9:00 pm, you can join us in the PMS forum for the Release Party. Always lots of fun! We hope to see you there! Hi everyone! It's the weekend! So excited about that! Today is a busy day on the ol' blog. I have a two-fer for you today. My Time Made Easy is doing a Year in Review group post and Just Us Girls has a sketch challenge this week for you...and a great one it is. Let's start with that. Kristin is our hostess this week and supplied this sketch for all of us. Using My Time Made Easy products, I created this card. I used several MTME products on this card. 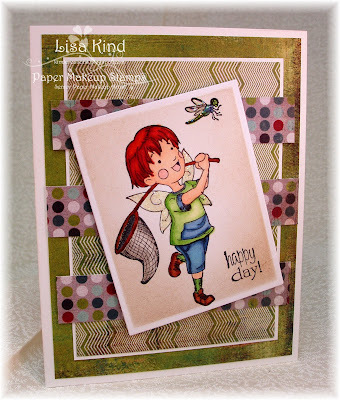 The gingham digi paper is from the Fluttering By digi pack. The daisy is from the Flutters and Flowers cut file. I cut out the smallest one, ran it through the swiss dots embossing folder, and added a yellow crystal bling. The leaves are from the same cut file. 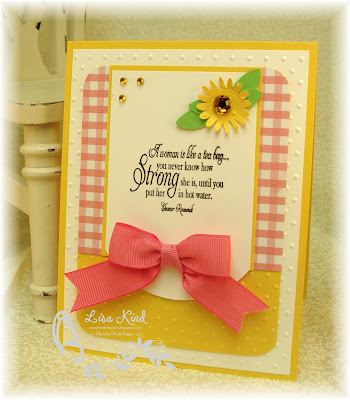 The sentiment is from the newly released Keep Strong stamp set. (You'll see why I chose this sentiment in a minute.) 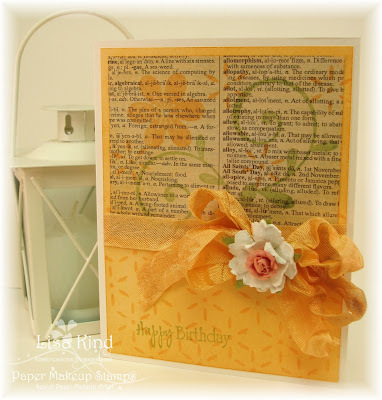 I paired all this with SU's Daffodil Delight yellow cardstock. What a pretty color! Here's a closeup of that great sentiment. I just love it! As many of you know, I'm a teacher. Many school districts are facing major cuts in budgets and my school district is not being spared from these cuts. They are restructuring the entire district and many are losing their jobs. This week, I sat in meetings with my principal and superintendent during which three of my colleagues were told they were losing their jobs...not fun! They are all fantastic teachers and team players. It is such a shame that we are losing them. I wanted to give them something that conveys a "keep strong/stay positive" message. So I created this to go with the card. MTME has a couple of tea themed templates, and I chose to use this one called Tea Tabbed Box. 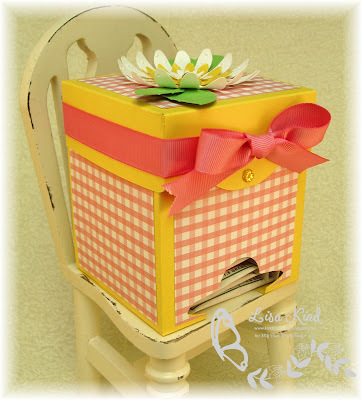 The base of the box is the daffodil yellow, and I decorated each side with the pink gingham digi paper. 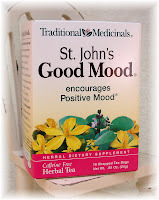 I purchased some tea bags that are supposed to encourage a positive mood. Here's the original box (you can see my color inspiration) of tea bags I purchased. 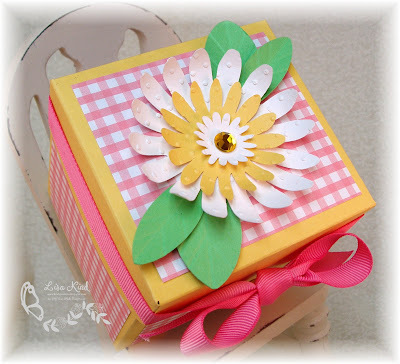 Now for the top of the box, I added a beautiful flower using the same Flutters and Flowers cut file. I cut two of the flowers in white and one in the daffodil yellow. They were run throught the swiss dots folder and the petals were curled. The leaves were cut using the same cut file. I added another yellow crystal in the center. 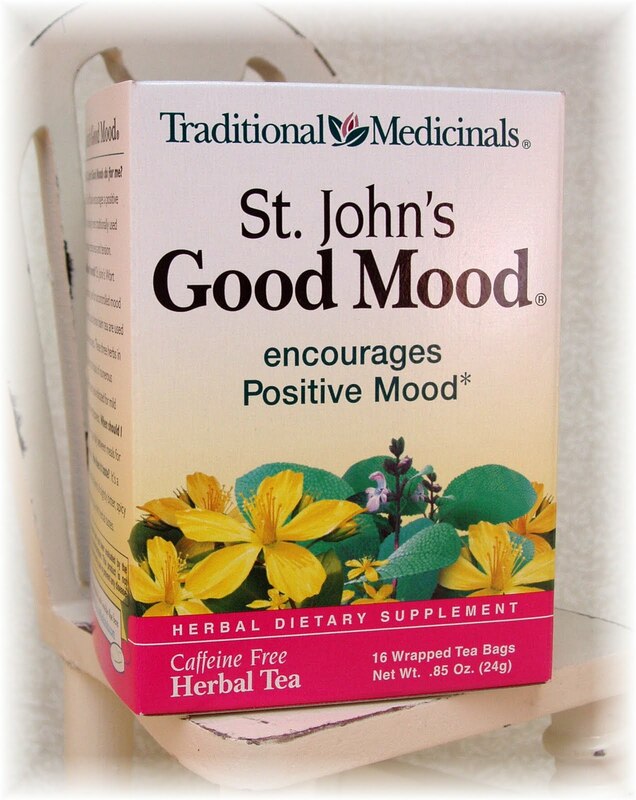 I put the tea bags inside and tied it off with a pink grosgrain ribbon. And finally, here they are together. I have only made the one set...I'll have to get busy and make two more so I can give one to each of the girls. The box comes together surprisingly quickly (if you have a Cricut it's even easier). I hope they like it. You can stop by the JUGs blog to see more cards using this great sketch and participate there as well. We have a new guest designer this month, Alyssa Scritchfield, too! Please stop by their blogs to leave some love. Lauren has the entire MTME DT linked up at her blog (or you can see the links on my sidebar), so please stop by there as well to see what the girls are reviewing from this past year. Whew! Another long post! I hope you enjoyed it. I'd love to know what you think.